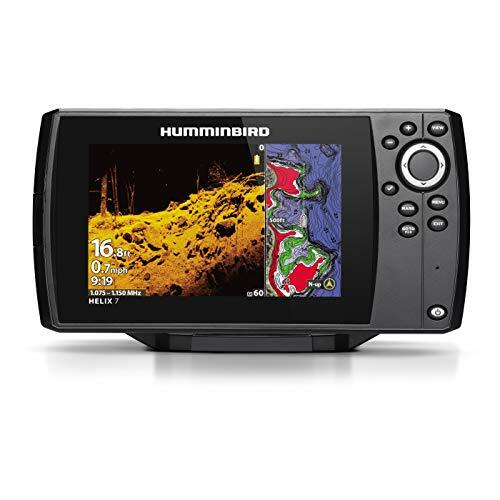 Humminbird HELIX 7 Fishfinder. The 7", ultra-wide display gives you ample room to view the many pre-loaded split screen view options. NEW to HELIX 7- MEGA Down Imaging: Get unprecedented underwater clarity with coverage down to 125 feet below your boat. You'll unlock new details with up to 3X more output than standard Down Imaging sonar. Dual Spectrum CHIRP: Before you cast, know what's down there thanks to long, well-defined fish arches, and a clear view of fish-holding structure and the bottom. Powered by our proprietary, Low Q CHIRP transducer, Dual Spectrum offers two ways to search: wide mode for maximum coverage and narrow mode for maximum detail. SwitchFire Sonar: Take command of how your sonar returns appear. With two display modes, you can add or remove detail, account for water depth, temperature and turbulence, even watch lure presentations - all at the push of a button. LakeMaster Compatible: Upgrade to the unrivaled accuracy and detail of Humminbird LakeMaster maps. From easy-to-read contours, to highlighted depth ranges, to scrollable lake lists, you'll have all the tools you need to make every moment count. Includes transducer and mounting hardware, power cable, gimbal mounting bracket.